While vacationing, I usually take a small notebook and write lists of memorable details that happen every day. When we return home, I tear out the pages and put them in the Craft Keeper with the ephemera. When I'm ready to make the layouts, I use these lists to recreate the vacation, even if I make the album years later. I'll discuss this more on Thursday. That's it for today! Tomorrow I'll be back to share my process for organizing the album. Hello! This week we'll be writing about letting go of the old and welcoming in the new. Today I'll talk about my nightstand. I used to work in a bookstore, so I collected and read a lot of books. I've been in a book club for a while. I'm also a book addict, picking up books I see on sale that I like. As a result, I ended up with over 30+ books on my nightstand. Ouch. This is especially tough for me because I'm an English teacher. When I'm grading papers, the last thing in the world I want to do is read to relax. So my bookstand has been...well, booked! for a long time. Since I listen to the podcast Books on the Nightstand, this has been killing me. I have a huge To be Read (TBR) list, but I feel I can't start it until I lower this pile. Hence my resolution, which I started last year: reducing the pile. I made a list of the books I'd read from the pile this year and listed the ones I wanted to read next. I didn't make my goal of reading them by the end of the year, but guess what? I am now reading The Days of Rondo, which, if you look closely, is third from the bottom. YES! I should finish this goal by the end of February and read the rest of the pile by summer. I have many more books on my list, but I look forward to reading these the most. Hooray! Nothing like achieving a goal. Thank you for visiting today! I hope you'll come back tomorrow, when I'll share another hobby long neglected that I am dedicating myself to dusting off and returning to. Hello! It's Jennifer Larson with you for the next few days to show you how I try to create a simple vacation album. Today I'll focus on the initial writing that organizes the album. When we think of writing, we think about the journaling, but writing involves much more, including the initial planning. Scrapbooking a whole album requires another kind of planning: determining the subject of each "chapter" or layout in the album. I'd like to share some planning for a vacation album today. Side note: I am VERY behind in scrapbooking vacations. The album I'll be planning with you is our Disney trip from 2010. (I'm now putting on the cone of shame.) It's on my bucket list this summer to finish it, so I'm using the next few days to get a jump start on it. Please note that while it is generally chronological and organized by place or event, I also break that chronology in an album when needed. For example, sometimes I'll make pages about something we did the whole trip, or I'll put together a special page to focus on one detail. In this year's vacation album, for example, I may focus on cribbage, places we ate, and our dog as a major hiker when I finally scrapbook this vacation, hopefully before the year 2021. Thank you for letting me share some ideas for scrapbooking your vacation! Tomorrow I'll be back to show how I put a lot of photos on the page in a clean and simple fashion. This month our theme was about our every day lives. I got to thinking about how there are things that I do at the same time every day. For instance, every single weekday at 8:20 we are racing to not miss the bus. Monday through Thursday at 3:40 I am in the car driving to the gym. Thursdays at 7:00 we are headed to the church for youth activities. On Sundays, we go to church (though the hour on that one changes each year!). This schedule is what makes me happy and keep our lives orderly and centered. Then there are the things that I never write on a calendar, but they happen pretty regularly. For instance I launder the bed linens every Monday morning. Like clockwork. Nigel practices the piano for half hour each night, but not at a set time. One year, when the kids were smaller and our Friday nights we calmer, we did a pizza picnic and Psych every Friday night. As I thought about our repeating patterned lives, I got excited to think about making pages based upon a time. And repeating elements. And our calendar. I can't wait to sit down this week and put some together. I might even see a mini album in my future. Having such focus will be certain to bring results, and to give my journaling a starting point. Here is my first layout! It's on linens. I love them--especially when they are clean. Mmm. The smell of happiness. What do you think? Doesn't it sound fun? Will you join me in creating some time/pattern/calendar/schedule pages? Pretty please? It's going to be so fun! Hello! It's Jennifer Larson, and I'd like to share an idea that may be unexpected: journaling with few or no words. Thank you for visiting on this first Monday of May, Star Wars day (May the Fourth be with you!). I hope you feel liberated about adding fewer words to your next page and think about raiding your supplies to express your feelings instead. First, I used a kit, my March Scrapbook Circle kit. Using kits makes my product selection easier. Next, I picked my favorite colors--yellow, orange, blue, and green. I sewed on the page. Another favorite! I love mixing fonts/products for titles. Thank you for sharing my page! I know that sometimes we pressure ourselves to create something original each time, but why not just surround yourself with your favorites? Hello lovies! 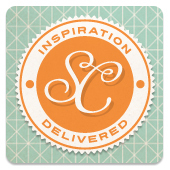 Tracie Claiborne here to tell you about my favorite approach to scrapbooking. It's my scrappy motto which is, "Start With The Story." In the early days of my scrapbooking, I started with photos or even pretty paper and stickers but as the pages piled up, I realized many of my layouts said very little about the story behind the photos. When I grew in my scrapbooking skills, I began to add more journaling and now journaling is my favorite part of scrapbooking! I scouted the interwebs for pictures of her favorite bands, candy, magazine and television show and I was pleasantly surprised by how great the images printed. I also looked in my phone for a few recent pics of her to make it more personal. I added simple, yet descriptive, journaling and here's a little snapshot of her life right now! The journaling is list-style which is my favorite way to go. Anyone can make a list, right? If journaling leaves you stumped, give this style a whirl! I wanted to keep the layout happy, fun and appropriate for her age so I chose happy colors. I cut the title on my Silhouette Cameo and added three groupings of embellishments to create a visual triangle. So how about it? Would you like to start with the story? I hope I've inspired you to create a layout that tells a story that might be lost if not written down. It's a great way to make your scrapbooking meaningful! Hello! It's Jennifer Larson. You know what one of my favorite things about scrapbooking is? Seriously, I love creating, but unfinished layouts float in the air about me all day, haunting me as they remind me of what I have not yet completed. When I get a chance to finish a page or project that's been in process for a while, I rejoice and do a happy dance. I picked photos that I had already printed but never scrapped to make the process quicker. I hand-wrote the journaling to make the process quicker as well, though my decision to machine sew every letter sticker down did nothing to speed up the finishing. Still, I'm happy with the final product, most especially because it is finished. Yes!